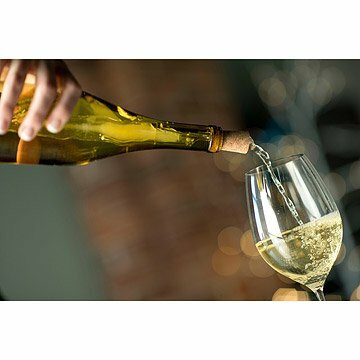 Chill, aerate, and pour your favorite vintage using the same innovative device. A pourer, aerator, and reusable freeze gel chiller in one, this innovative design allows you to serve your favorite vintages at their ideal temperatures without diluting the flavor. Simply freeze the Corkcicle Air prior to use, then place in the bottle after you've poured your first glass. Once you're ready to pour again, the wine makes its way through the open cork, letting its flavors breathe as it flows into your glass. Made in China. I've used this product in reds to airate and keep my room temp reds at cellar temperature. I look forward to using it in white wine. A guest accidentally broke the cork from the icicle inside. It it reconnected easily. I highly recommend! Absolutely satisfied; would give as gift! There was no special occasion. I just enjoy wine, & this product was true to form. This works well, but I noticed after my first red there was some wine that got into the inside liquid, which probably means some of the inside liquid got out as well. I'm not sure what is used as the freezing agent, but I hope it's not toxic. For someone that likes their wine chilled,this was perfect. Can't wait to use it! Great gift for my wine consuming sister! I'm sure my sister will use this product daily. The item is great for a while but will begin to leak after being refrozen several times. It does maintain a good chill on wine that is already cold but it won't bring a warm wine down to a "chilled" temp. On my short list for gifts for friends! One of my favorite uses of this is while I'm cooking I 'll open a bottle of wine, grab the corkcicle and chill the wine so when dinner is ready so is my wine. I love giving this as a gift for friends its always been a hit.